The National Archives and Records Administration regional office in Seattle is providing the roadshow from 10am to 2pm on Saturday, May 14 at 6125 Sand Point Way NE, Seattle, Washington, USA. Their intention is to help the public learn how to preserve their treasured family and personal materials. At the roadshow, the public can bring questions about preserving their personal or family documents (in any format) and get free practical advice. There are workshops to attend, raffles, and competitions. Unfortunately, I suspect most of the readers of this blog won't be attending - it's rather a long way. For these readers, however, there's a really useful 'Public Resources' section and I suggest you look at it. As reported in our previous blogs, Bygone Borderlands - Family and Local History Weekend and Bygone Borderlands - Flodden 500 Projects, the unmissable event this coming weekend (14th and 15th May) is Bygone Borderlands at the Guildhall, in Berwick Upon Tweed, England, TD15 1BN. The programme of talks was published today, and it looks very interesting. We have a stall there, both days, with a variety of members present. We'll be glad to help you with your family history problems and queries. The Orkney Archive has blogged Which is scarier, Dr Who or Press Gangs ? You decide ! They show a typical document dated 25th April 1803 authorising the impressment of men to run the ship. The blog asks "Are you delighted by what you have just read? Are you revulsed and appalled? " It neither horrifies nor delights me. Fighting ships had to be manned and in the absence of a means to call up people for service, and the means by which people could assent, appeal, or protest; it was a reasonable method. All of those who served (whether pressed or not) in the Royal Navy would have endured very harsh conditions and privations that we wouldn't find acceptable today, and many were badly injured or died. However many survived, and some survived with quite a lot of prize money and returned wealthy beyond their previous wildest dreams. Far worse would be the suffering of the families left at home, whose father or husband had been the major income for the household. Royal Navy ships that captured an enemy ship, or cargo from other ships or countries got prize money to the notional value of the cargo and or ship. In the Napoleonic wars at the end of the 18th and beginning of the 19th centuries, the prize money was divided: 1/8 to the admiral, 1/4 to the captain, 1/8 between the officers, 1/8 between senior warrant officers, 1/8 between junior warrant officers, 1/4 between the crew. What I find unacceptable, even by the standards of the day, is that there was no state support for the parishes of those who had men pressed for service. In the Scottish Borders, impressment would have affected mainly the Berwickshire coastal villages, though enterprising press gangs may have ventured further inland, or to villages along the shores of the Tweed, since much of it is navigable even with the comparatively heavy boats of yester year. More information at 'The press-gang afloat and ashore' and Wikipedia article on Impressment, also a shorter article from the Royal Naval Museum 'Impressment - The Press Gangs and Naval Recruitment'. The National Archives of Ireland in partnership with Library and Archives Canada has digitised the household returns and ancillary records for the censuses of Ireland in 1901 and 1911, and you can search them and view the results for free. The 1901 census is arranged by street or in rural areas, by townland (the smallest division of land). Just like our censuses, it shows each member of the household; name, age, gender, relationship to head of the household, religion, occupation, marital status and county or country of birth, and whether they can speak Gaelic (although in this case it's presumably Irish Gaelic). In 1901, there were fewer differences between Irish Gaelic and Scottish Gaelic, and my granny who was a native speaker of Scottish Gaelic rarely had any difficulty in reading Irish Gaelic or talking to people who spoke Irish Gaelic, and generally they understood her. The 1911 census also shows for wives: the number of years married, the number of children born and the number still alive. Thanks to Marjorie Gavin for drawing my attention to this resource. Chris Bowles the Scottish Borders Council Archaeology Officer circulated this note this morning. The Bygone Berwick weekend will take place between the 14th and 15th of May, and as part of this the Heritage and Research group of the Flodden 500 project will be presenting an exciting opportunity to help us gain a full understanding of one of this region's key historical events: the Battle of Flodden. As many of you know, 2013 marks the 500th anniversary of the Battle of Flodden. Archaeological investigation and historical research is on-going in Northumberland as part of the Flodden 500 project, and we are hoping to bring to life a similar project in the Scottish Borders region. If you are interested, simply turn up on the 15 May from 11 - 12 at the Guildhall in Berwick (Council Chambers) for a discussion of the on-going research and our hopes for a Scottish project. 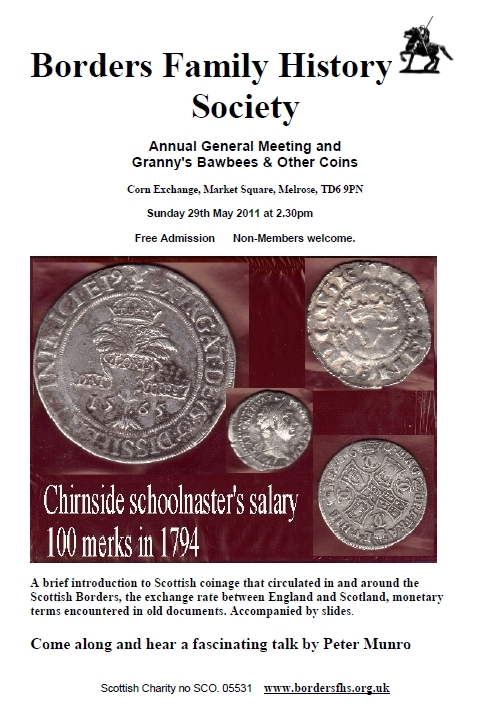 We will be attending the West Lothian History and Heritage Fair on Saturday 7 May 2011. Venue: Linlithgow Academy, Braehead Road, Linlithgow, West Lothian, EH49 6EH, from 10am till 4.30pm. 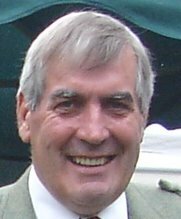 We will have our own gravestone inscriptions/monumental inscriptions, poor law, and local history publications and other resources and books on the Scottish Borders. There will be talks by expert historians on aspects of Scottish, local and family history, and a family history workshop. 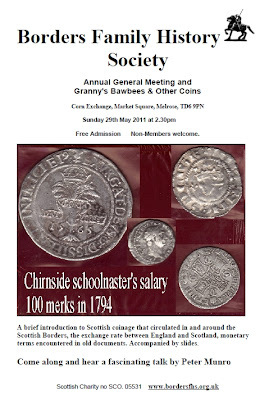 There will be other family history societies and local heritage organisations there with displays, information about their work and publications for sale. Admission to the fair costs £2.00 (children under 16 free) but this includes all the events and talks.